Hey Finland! Let’s get digital! Misconceptions and misunderstandings aside, business is changing and with that change comes the need for professionals that know how to adapt and grow in an ever-evolving business landscape. Change can yield both positive and negative results, but in most cases it comes down to the strategy and how that plan is implemented as to whether or not your efforts will succeed or fail. Something great is happening in Finland right now. Businesses that have been around for years – many of them even several decades – are starting to invest resources and educate themselves in digital marketing in an effort to reach new generations of consumers; primarily millennials and teens. Making the changes and taking the steps to do so is great, but the old adage of, “a good plan today is better than a perfect plan tomorrow”, doesn’t always apply- especially in this instance. Just wanting to change and hiring a bunch of hot-shot, hipster-esqe recent-grads isn’t going to do it, and just because your new-hires have 500+ followers on Instagram doesn’t mean they know how to professionally manage your business’ corporate social media presences. In fact, if you want to really use any saying to characterize the direction of digital marketing and business operations, “it takes a village,” would probably be the most accurate. “It takes a village?” Yes, and it’s really easy to understand why when you think about it. Although usually attributed to the raising of children by a community, “it takes a village” can also be used to illustrate that true success in a digital marketing is dependent upon many factors and parts within a business working in unison to best achieve the goals and expectations that are being laid down as you enter this brave new endeavor that is digital marketing. Rome wasn’t built in a day, and successful digital teams and plans weren’t put together overnight. Educating your staff, bringing in consultants, and working with freelancers can be a great way to introduce yourselves to this new sphere of operations. Luckily, there were some early-adopters -yours truly, included- that are determined to help businesses of all shapes, sizes, and industries succeed in the evolving, Finnish economy. Bottom line – if you’re going to wade into the digital marketing waters, make sure that you have a lifeguard there to teach you how to swim. A lifeguard like Nutmegger PR! Did you know that October is International Breast Cancer Awareness Month? During this month, women all over the world take proactive steps to help prevent breast cancer by attending their annual mammogram. For Wake Radiology – one of our wonderful clients – this is also one of their busiest times of the year. Although we had been primarily helping Wake Radiology with their social media optimization over the past year; they asked us to flex our design and creative muscles for their Breast Cancer Awareness Month across all of their social media channels. To help them with this we decided to create three, Wake Radiology-branded infographics to help illustrate three important themes: providing breast cancer statistics, highlighting the importance of early detection and the often-overlooked topic of male breast cancer. Here are all three of those infographics; in that exact order. 2015 has been a very busy year for Nutmegger PR. From developing social strategies and digital communications plans to translating texts for businesses entering the Finnish market and delving into more graphic design work; we’ve absolutely kept ourselves busy. The remainder of 2015 promises a busy schedule with plenty to do, but before we get into too much of that, we’d like to first talk about some work that we’ve been doing with a very exciting client: Amcham Finland. Amcham Finland is a dynamic and fast-paced non-profit organization that is completely member-funded. They’re led by their inspiring CEO, Kristiina Helenius, who took the Amcham Finland reigns in 2007 and has expertly led this Northern European business hub and its staff of about 20 to new heights and continues to grow their member-network while boasting a 90% retention rate. Some of their most recognizable members include Stora Enso, Kone, Fiskars, Wärtsilä, & Nokia – some serious heavy hitters not only within Finland, but on a global scale too. It’s not all about the ‘big boys’ with Amcham though. In fact, with members spread out across more than 20 different industries of business; Amcham is one of the most diversified and international organizations for business growth and development that has yet to even reach its full potential. Recently, Amcham Finland struck a deal with Nutmegger PR to help develop and implement a communications strategy to focus on their US operations that began in Autumn 2014. This broad project has taken the first steps in promoting Amcham Finland’s American members, with the goal of growing their US member-base and to encourage more North American companies to test the Nordic business waters. That brings us to purpose of this post – to brag up our client (Who, BTW, is awesome. In case you hadn’t figured that out yet. ), and to show off the first of what will probably be four infographics that we will be creating and releasing between now and the end of 2015. It may not look like much, but it’s brief, to the point and helps to provide a little bit of insight as to why Finland is an excellent ‘Business Destination’. So you’ve built your strategy and laid out your expectations for your brand’s social media presence. You’ve read and studied about the intricacies of how to win in social media, but you’re still a little foggy as to how you’ll be able to really succeed in this new and challenging endeavor. You recite the same sentence over and over in your meetings; “if you don’t ask, the answer is always no.” You realize that in order to win, you first have to play. It’s a risky wager, but quite possibly a very rewarding one; especially if you know how to interact and communicate with your online community to effectively represent your brand. Recent studies have taken a whole new look at customer feedback and what your community is most likely to desire from their interactions with you and your brand via social media. Social media and digital marketers consistently find themselves in situations where they have to defend the value and opportunities that social media provides. Thankfully, these reports have gathered and presented the information necessary to be able to provide those of us in the industry – or those looking to establish themselves within the social media sphere of operations – the hard facts and supporting numbers to help us succeed in this battle against the naysayers! 1) It’s called Social Media for a reason. It always blows me away when brands and community managers wonder why they haven’t seen the results that they want from social media, but they don’t make the effort to really interact with their community on multiple channels. According to a study conducted by Hubspot, online consumers and social media users expect their favorite brands to be actively participating with their communities on at least three different social networks. So wait, you mean to tell me that people actually want to communicate with us on more than just Facebook and Twitter? Yes, and not only that, but they want you to be actively engaging them! Don’t sit back and wait for everyone to come to you. Reach out and put your arm around your audience’s shoulder and talk to them. Stop agoraphobic behaviors and start communicating with your community! In addition to Facebook and Twitter (the top vote getters for social networks in this category), consumers listed Pinterest, Instagram, YouTube, LinkedIn, and Google+ as the next five most-desired places for brands to have a social presence. 2)We’re here to listen and help, not just post memes. 35% of consumers have sought out customer service help through social media. 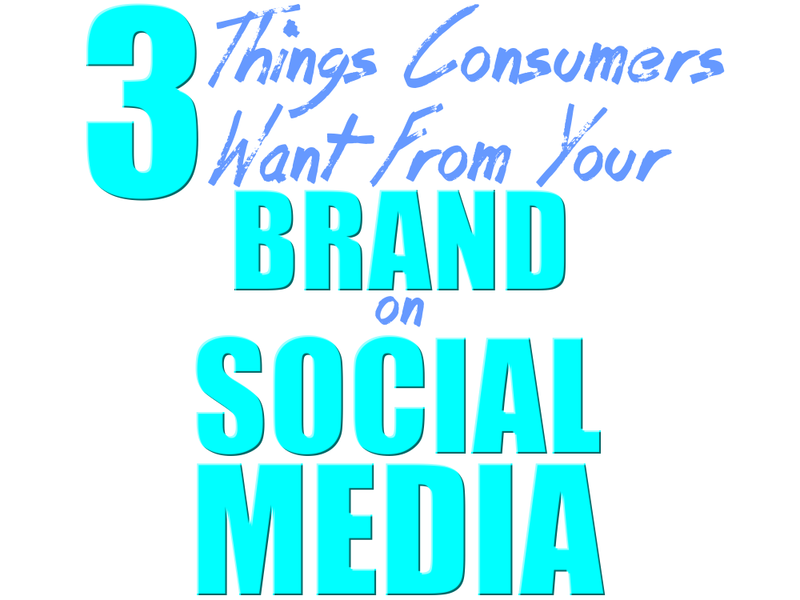 35% have used social media to complain about a brand or its customer service. 52% have used social media to praise or compliment a brand or its customer service. 59% said that the brand responded to their interaction and that by doing so, 51% of those said that the acknowledgement and interaction with the brand provided them either a somewhat more or much more favorable opinion of the company. 38% of customers expect a response within one hour of posting their feedback. That 38% is further broken down like so: 8% within five minutes, 16% in less than 30 minutes, and 14% in less than an hour. 29% expect a response within 24 hours of their initial contact. 8% expect their feedback to be addressed within 48 hours. 24% don’t expect a response at all. The most glaring figure, of those listed above, should be the last one listed. 24% of users do not expect their voice to be heard or acknowledged by the brand that they are trying to communicate with. Not only is that figure entirely too high, but it’s an easy one to improve upon. The power and importance of social customer service and social CRMs will only increase over time as the spread of digital services only continues to grow day by day. 3) Hey man, can you do be a favor? Umm, no. We’ve all had someone like this in our lives. The friend that you’ve known for years and you get along with just fine, but they seem to always be asking for favors. It’s not that they’re difficult or make you feel as though you don’t want to be friends with them anymore, but it’s the constant asking without the possibility of returning the favor that bugs you. Whatever form it’s taken in your life, you know who we’re talking about, and as a word of caution and advice: don’t be that person with your brand on social media. Social media is a place where people go to interact with friends, talk about their lives with others and find entertainment in the forms of funny photos or amazing videos. The quickest way to get a bad reputation and lose members of your community is to go sales-heavy with your content. Constantly pitching products and services, bragging about your own achievements, and neglecting your community are sure-fire ways to fail at social media and alienate your consumers. People don’t use social media to buy products. That’s why search engines like Google and Bing have spent so much time and development on making it easier to find what you want when you want it. The best way to establish and integrate a sales strategy through social media is to utilize the total social experience to engage your target customers. By providing value and useful knowledge to your community, you’re able to increase the position and power of your brand through a more natural and organic interaction. A 2014 Gallup study revealed that 35% of consumers stated that their interactions within social media had an influence on their purchasing decisions. This figure may not seem that impressive, but take into account the vast amount of personal opinion and feedback that is available to consumers via social media in the form of reviews and complaints, then it’s rather difficult to deny the far-reaching power a brand’s reputation can have over a consumer’s decision making process. Whether directly or indirectly, it’s safe to say that social media can make or break a sale for many companies and brands. The most important things to take away from this, are that you manage your brand well on social media by being social and engaging, listening to and servicing your communities, and by being patient and strategic with your sales tactics. If you can do these well, then you’re on the right track to succeeding with social media. It’s Saturday night and you’re out with your friends to see the latest superhero movie that just hit theaters. That shouldn’t be too hard to image, considering they come out every couple weeks or so – or perhaps it just feels like they do. You buy your ticket, get your drink and goodies from the snack bar, and finally head in to enjoy your movie. If you’re lucky, you’ve only been scalped for 30 bucks, and although you really wanted to see this movie, you’re a little peeved because what used to cost you the same price as a meal at a fast-food joint, is now the same as a three-course meal if not more! You decide to express your emotions in the most common way in today’s world; so you share them on social media. You update your Facebook status, Tweet at the movie theater, and post a photo of your receipts on Instagram before switching your phone to silent and start watching the movie. A couple hours later, the movie is over and you check your phone. Two missed calls from your Mom (no matter how old you are, she still panics when you don’t answer), a couple texts from friends, and a handful of notifications from Facebook, Twitter, & Instagram with people liking, favorite-ing, and heart-ing your posts. After calling Mom back, you read the comments on your posts and realize that the theater has responded to you and wants to learn more about your customer experience. You decide to reply and strike up a dialog that leads to you receiving free movie tickets and vouchers to use at the snack bar. You feel special, as though this is the first time this has ever happened in the history of the social media. Well, you may be special, but this is not an abnormality anymore. You’ve just been personally introduced to social CRM – the customer service of the present and future. I can see you scratching your head now. What is ‘Social CRM’? 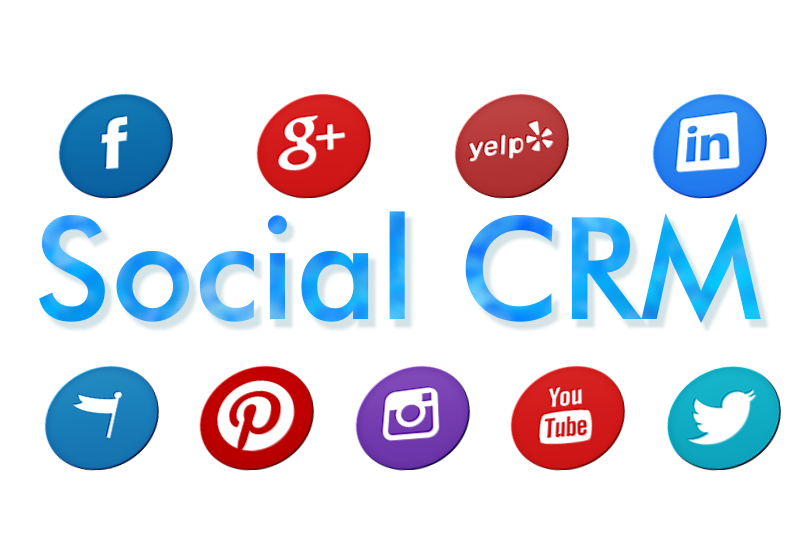 Simply put, social CRM is the practice of using social media to engage with and manage a company’s relationship with their customers. You may not realize it, but when your favorite brewer posts a photo of their latest seasonal beer and asks you what your favorite is, you’re being engaged in their social CRM. By liking, sharing or commenting on this post, you have now volunteered to become a part of their conversation and open yourself to the possibility of being contacted. Social engagement is a key indicator in measuring the success of a company’s social media campaigns. Promotions and giveaways are other great examples of the engagement side of social CRM. The other side of the social CRM pillow deals primarily with customer service. If we go back to the opening scene of this post, we are able to see how many companies are now utilizing social media to manage their customer service interactions and reputation management efforts. Before the advent of social media, the general consensus was that three positive reviews could overcome one negative review. Whether for better or worse, this is not the case any longer. Although debated by many, let’s say that for every negative review your company has, you need ten positive reviews to maintain your standing with your customers. In the age of social media, examples of poor services and experiences can spread faster that wildfire. The companies most concerned with customer service and their reputation have been eager to adopt a more pro-active approach to social CRM. An excellent example of this is in the case of McDonalds. Whether you love or hate the Golden Arches, McDonalds has instituted one of the strongest social CRMs to focus on customer satisfaction and service; they even have a Twitter handle dedicated specifically to this! McDonalds isn’t alone in this respect, but they are extremely punctual with their responses and although it may sound a little automated and robotic, they generally solve their issues in a timely manner and are able to satisfy the majority of their customers. The same can be said for budget airlines like Norwegian. In August 2014 I had an issue with a booking being changed while travelling back to Finland from the USA. I decided to contact the airline and voice my dissatisfaction on their Facebook page because, having personally used social CRMs and communities in my own work, I wanted to see how well an international, budget airline would deal with this issue. Within minutes, someone had replied, apologized for the situation, and provided me with another avenue through which to contact them. Although they didn’t change the booking back to what it originally was, they did show that they cared and were attentive to my concerns. You can’t win every time, but it sure felt good knowing that I was being cared for in the same way that I had cared for my own communities. Hopefully this will give you a taste of what social CRM is all about. As this topic is only growing in popularity, keep your eyes open for the next article in this series as I explore the intricacies of what makes social CRM such an intriguing and exciting topic.